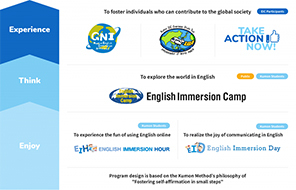 Kumon’s English Immersion Camp (EIC) started in 2001 with the aim of nurturing individuals who can make a contribution to the global community by using their ability to communicate in English. In this camp, children take on the challenge of spending several days in an entirely English-speaking environment with people from different countries and backgrounds. The number of people around the world who speak English as a foreign language is far greater than the number of people who speak English as a native language. English is considered an important tool not only for communicating with people who speak different languages, but also for understanding differences in cultures and for respecting one another. Children spend time with camp leaders from various countries and challenge themselves to communicate with them in English. They also learn the importance of accepting and respecting each other's differences. Over the years, more than 3,000 elementary-school-aged children have come into contact with the camp leaders. While gaining a global perspective and learning about current events around the world, children become more confident and start to believe in their potential. Participating children also talked about their goals and dreams. During the EIC, children build a strong relationship with the camp leaders, which leads to various post-camp activities. 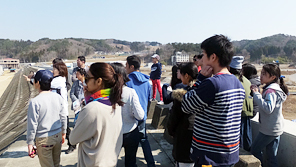 Together with former camp leaders, some former EIC participants visited the Tohoku area, which was struck by the Great East Japan Earthquake in 2011, and learned that there is still a great amount of work to be done. Others travelled to Indonesia and spent time cooking and eating with street children. We hope that these ambassadors of world peace can make a contribution to the global community.